They reached the pinnacle of their careers in spite of-or sometimes because of-substance abuse. They struggled with sobriety while striving for success, often risking their professional lives on the road to recovery. Now, with honesty, courage, and insight, they share their remarkable stories. Michael Deaver, former White House deputy chief of staff, describes his recovery as “the single most powerful thing I've ever experienced”-even compared to meeting presidents and kings. Walter Yetnikoff, former president of CBS Records, talks about leaving the music industry to find meaningful work that enhanced-and was enhanced by--his recovery. You'll also hear from James Abernathy of the Abernathy-MacGregor Group, bestselling author William Cope Moyers, and ten other business leaders who found newfound success through the healing power of second chances. Gary Stromberg is a successful businessman in recovery. He cofounded a music PR firm and serves on the board of Positive Directions. Jane Merrill coauthored The Harder They Fall with Gary Stromberg. 5.0 颗星，最多 5 颗星Examples of addiction leading to big falls from the top, and big comebacks. Successful professionals sharing needs to be done more. Great collection of stories for anyone looking for inspiration or reminder that addiction isn’t picky. It will bring you down and you can get back up. Comebacks are possible. Professionals still face huge barriers of reputation destruction and the painful, powerful, hidden secret in business and corporate culture of addiction stigma and lack of understanding. It’s real. Very real. More of these stories must be shared. You don’t get to the top without being driven, smart, and willing to take risks, out yourself out there. Big risks, big rewards. Addiction can’t take the good side of that quality. Stories prove it. Big successes then lead to big falls. But as these repeatedly demonstrate, comebacks are possible and can success be bigger, better, and more meaningful the second time around. Everybody loves a comeback—they just need to be educated that comebacks from addiction are the same as any other. 5.0 颗星，最多 5 颗星A must read for recovering alcoholics and drug addicts! Some addicts and alcoholics seem to "fall forward" in life. I believe that's because, at first anyway, the drugs and alcohol work; they do what we want them to do. They give energy, boost creativity, and uninhibit us so that we don't notice the fears and insecurity that would otherwise restrain us from taking the chances that are sometimes necessary to be successful. Drugs and alcohol can propel us to the top of the mountain, but then they proceed to drive us right off the other side of the cliff. That's what happened to Peter Jaquith. Fueled by alcohol, he became a Wall Street millionaire, and started smoking crack at 57, and quickly found himself homeless and penniless. His story, and many others who made it to the top of the mountain in their careers, are found in "Second Chances" by Gary Stromberg and Jane Merrill. There are stories by Michael Deaver, deputy chief of staff under Ronald Reagan; Andrew Zimmern, celebrity chef and TV personality; Walter Yetnikoff, former president of CBS Records, and many more. In particular, I really enjoyed, and gained much insight from Wiktor Osiatynski's story. He's an internationally renowned legal scholar, and he says we addicts and alcoholics have five problem areas in our life that we must address: the problem of self-image, of ego and ambition; the problem of how we relate to God and spirituality; the problem of how we relate to other people; the problem of our fears; and the problem of what gives sense and meaning to our life. 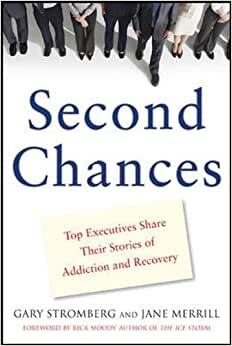 Just like "The Harder They Fall", also by Stromberg and Merrill, "Second Chances" is the equivalent of a hundred recovery meetings all in one book. It's chock full of honesty, courage, and remarkable insight, and it's a must-read for all recovering addicts and alcoholics. Author of "Running Away From Me"
Very enlightening to read these diverse recovery stories from talented people who would never have realized their dreams if they didn't get sober. I especially enjoyed the various stages of recovery these people went through and appreciated that several emphasized the spiritual aspects of their development as being such an important aspect of their recovery. 5.0 颗星，最多 5 颗星Inspiring book! Bought this book when I was going through CD treatment. The stories are inspiring and made me realize that addiction can happen to anyone. There is hope...you can get through it and go on to a meaningful, productive life! It's nice to read about higher profile people who have dealt with it. The book is well organized and an easy read. I would highly recommend this book.